Once again the stoles made by NAGA for our chaplains in the Armed Forces have been re-styled in accordance with the office of the Rt. Rev. 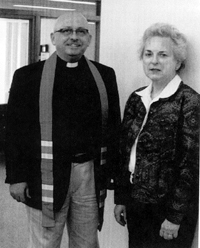 George E. Packard, Bishop Suffragan for Chaplaincies and the Rev. Gerald J. Blackburn, Director of Federal Chaplaincies and Executive Officer to Bishop Packard. I was asked to design a more modern and up-to-date stole for our chaplains. 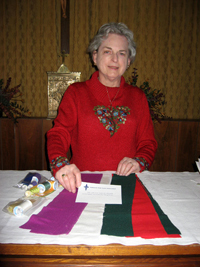 The newly designed stoles are reversible and made of raw silk noil in the liturgical colors of white, purple, red, and green. They are smaller, 2½” wide and 80” long, and do not have fringe or center back neck crosses. The orphreys are grosgrain ribbon bands in symbolic seasonal colors; for example, the purple stole has orphreys of blue — blue sometimes used during Advent. Having found a supplier for the silk and purchasing the ribbon and the thread, I went about cutting and assembling the kits. The kits come two stoles to a kit, or a set, with all the bits and pieces needed plus thread and instructions. I have tried to keep the home sewer in mind and have made every effort to keep them manageable. Two stoles in a kit helps keep the sets together. This is a wonderful ministry and I thank God for the opportunity to share this gift of sewing He has given me. All politics aside, I believe it is our calling to support our chaplains and our men and women putting their lives on the line for us. I would like to compile a list of sewers that I may call upon when the need arises. So, if God has given you the gift of sewing and you would like to participate in this wonderful ministry, please contact me. My address is 27 Village Hill Drive, Dix Hills, NY 11746 or derlejoan@aol.com.